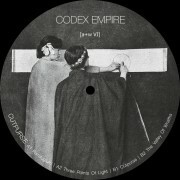 Here’s the second album from Codex Empire, a techno / industrial solo project from Vienna, Austria. Limited edition of 500 copies on vinyl..
Two cards selected from the 78-piece tarot card-set as utilised by the most famous occultist of the 20th century Aleister Crowley, were behind the first step. 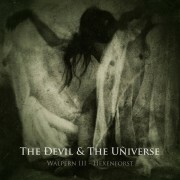 ”The Devil” and “The Universe” were the cards pulled that would prophesize a name for a musical-magical-transcendental composition and transformation project: THE DEVIL & THE UNIVERSE. Two musician friends, one goal–Ashley Dayour („Whispers in the Shadow“) , David Pfister („Black Manna“) and Stefan Elsbacher set out to create music from magical systems. They set out to give up their musical creativity and allow the legitimacy of magic and religious mechanisms form musical rules.The process and its system dictated and created not just phonetic anarchy but also examples of sound perfection. 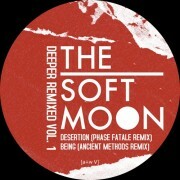 Following the release of his third studio album Deeper earlier this year via Captured Tracks, Luis Vasquez a/k/a The Soft Moon has announced the release of Deeper Remixed Vol. 1 (co-released by Captured Tracks and the Berlin-based record label aufnahme + wiedergabe) and Deeper Remixed Vol. 2. Limited edition of 800 copies. Brooklyn post-punk/dream pop band The Harrow walk a fine line between the alluring and the surreal. Driving, club-centric electronics nestle against lush organic instrumentation, woven with vivid songcraft. The result is a hauntingly familiar sound that is never complacent in scope. 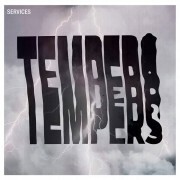 Tempers are a NYC-based duo comprised of Jasmine Golestaneh and Eddie Cooper. The duo’s dark, ice-cold electronica blends a sinister slow static disco with danceable beats, a hinting of pop sensibility imprisoned in an almost gothic, industrial soundscape. Limited edition of 300 hand numbered copies on white vinyl.